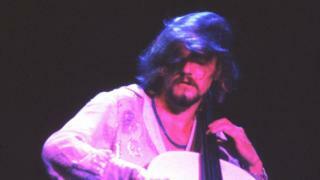 Electric Light Orchestra and Wizzard cellist Hugh McDowell has died from cancer at the age of 65. He performed at ELO’s first concert in 1972 but left a year later with fellow bandmate Roy Wood to form Wizzard. McDowell returned to ELO shortly after, featuring on their albums Eldorado and Face the Music. News of his death was confirmed after friend and fellow ELO cellist Melyvn Gale posted a statement on his private Facebook page. ELO perform on set in May 1979. Left to right: Mik Kaminski, Melvyn Gale, Jeff Lynne and Hugh McDowell. He said: “I’m sad beyond words to have to pass on the news that my old friend and fantastic cellist Hugh McDowell passed away last night after a long illness. McDowell, who was born in London in 1953, began playing the instrument at a young age, winning a music scholarship as a 10-year-old at the Yehudi Menuhin School. He went on to attend the Kingsway College of Further Education, the Royal College of Music and Guildhall School of Music and Drama. McDowell performed with the London Youth Symphony Orchestra, National Youth Orchestra and London Youth Chamber Orchestra. He was invited to join ELO by Jeff Lynne when he was 19 and, bar his brief hiatus with Wizzard, remained in the group until 1979 when Lynne ditched ELO’s string section. After leaving the band, McDowell continued to play classical music and worked on arrangements for films and theatre projects. ← How do you score on this money quiz for teenagers? The beginning of the end for Chinese hip-hop?